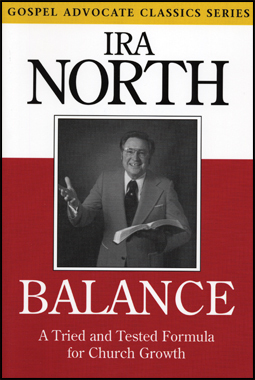 For a limited time (through 11/23/2013), Balance: A Tried and True Formula for Church Growth, by Ira North is available from the Gospel Advocate online store for only $6.99 (Reg $9.99). Simply enter the promo code (P010) at checkout to receive this special offer (applies to first 50 redemptions). In an era that seems to stress growth at the expense of soundness, Ira North’s principles warrant careful examination. North emphasized doctrinal commitment rather than mere pragmatics. His summary chapter opens with this statement: “God does not require that we be big, or wealthy, or powerful, or super smart. What our Heavenly Father requires is faithfulness.” Includes 22 chapters covering topics such as atmosphere, delegation, benevolence, the importance of children and youth, involvement and visitation. Softcover.